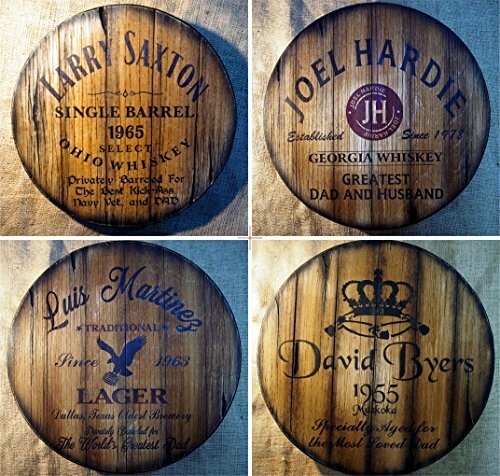 This personalized, made to order, aged look decorative sign, is the perfect gift for your dad and can be ideally combined with a bottle of his favorite whiskey. It can be fully customized by painting the name, date, place and message of your choice for creating a truly unique gift and a classy, handmade wall art with a rustic character. ~|~ A handmade piece so unique -due to each wooden plaque's different textures, the special aging process which varies for each item and your message, name and date- that no two are alike! ~|~ PERSONALIZING during ordering this product is real easy. There are 4 basic patterns you can choose from. Each design is inspired by the top favorites. Have a look at the product's pictures to select the one you like and follow the steps on the "Options" drop-down menu during checkout. ~|~ SIZE: We craft this piece in three standard sizes (11'', 16'' or 20'' diameter) ~|~ FURTHER CUSTOMIZATION: If you want to design something different than the standard patterns or you need a specific diameter for the plaque to better suit your wall, please contact us. We will be happy to create something special for you! ~|~ AGING. After years of experimenting on timber aging, I have developed a special technique that combines carving, painting and burning of wood. This aging process gives to each piece a unique, weathered character through my artistic perspective and I am able to offer you brand new and unused items, realistically resembling antique and timeworn. ~|~ NOTE: This artwork is not an actual barrel head coming from a whiskey barrel. ~|~ CHARACTERISTICS: Oak & distressed look sign that has undergone aging process, with the theme of your choosing / Crafted on 0.35 inch thick, birch plywood / Light weight & Wall-mounting ready / Completely handcrafted, made-to-order / Rush orders welcomed if doable. THANK YOU FOR VISITING! If you have any questions about this product by Woodcraft City, contact us by completing and submitting the form below. If you are looking for a specif part number, please include it with your message. Counted Cross Stitch Kit. I didn't say it was your fault. I said I was blaming you.